Many people start planning their retirement long before it’s time for them to give up the day job. There is something about the allure of long, restful days and the opportunity to do all the things you’ve never had time for that appeals to everyone. When it comes to celebrating this amazing new chapter in your life, a cruise is the perfect way to enjoy all the luxury of five-star living, whilst also seeing some of the most amazing places in the world. The joy of being retired is that suddenly you have time: time to relax, time to see the grandkids, time to go on a round-the-world cruise. You no longer need to squeeze holidays around work commitments, meaning that for the first time you can travel on your own timetable. Many cruise lines offer cruises that are several months long, letting you carry on the celebrations across the globe and enjoy being able to truly relax. What better way to celebrate your retirement from work, than to take a little break from the housework too? One of the most wonderful things about cruises is that you get five-star service, day and night. A few months away from the cooking, cleaning, gardening, and laundry is the perfect way to celebrate your new-found freedom. After all those years of ironing shirts and picking up socks, you deserve it! Nowadays, many young people choose to take a year out to see the world before focusing on their studies and careers. With so many achievements to your name already, why not enjoy the chance to do exactly the same thing? Round-the-world cruises can be an amazing way to see the highlights of the globe, from cuisine and culture to history and nature. What’s more, celebrating your retirement gives you the chance to travel the world in style – instead of lugging around a backpack wearing worn out sandals. As we get older, finding time for our friends can be a struggle between family and work commitments. Your retirement is the perfect time to reconnect with old friends, and make some new ones. Celebrating your retirement with a cruise is the perfect way to kick-start this. Perhaps you could invite some close friends to come along and share the celebration. It will also give you the perfect opportunity to socialise with other people who enjoy the same hobbies and pursuits as you. Retirement is your time to kick back and have fun, giving you the opportunity to try loads of new things. A cruise is the perfect place to do this, as ships often have an amazing range of exciting activities to choose from. Whether you used to ten pin bowl as a teenager and want to see if you can still score above 200, or you’ve always wanted to try ballroom dancing, a cruise is the perfect way to discover old loves and new passions. What’s more, it’s a great way to meet new people and a lot of cruise ship activities are often included in the price. Most cruise ships offer beautiful celebration packages to make sure that your big milestone is celebrated in style. From champagne on arrival, to luxurious cakes and gifts, there are plenty of ways to customise your cruise package and make it a celebration to remember. Start your retirement as you mean to go on – pampered, relaxed, and in the lap of luxury. 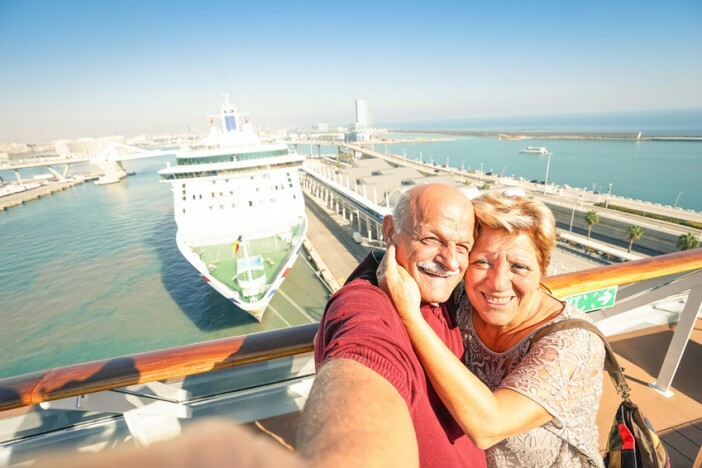 If you or that special someone is due to retire soon, a retirement celebration cruise could be the perfect way to welcome in this new chapter of your life. Whether you’d prefer a month in the sun or a journey around the highlights of the world, there is a cruise to suit your celebration perfectly. There could be nothing better than the luxurious experience of a cruise to celebrate all your hard work. For an amazing selection of idyllic, interesting and exciting cruises, check out our website. Or if you’re looking for advice on the right cruise, give our friendly cruise team a call on 1300 857 345.